Janea and Haleigh left for Colorado yesterday. 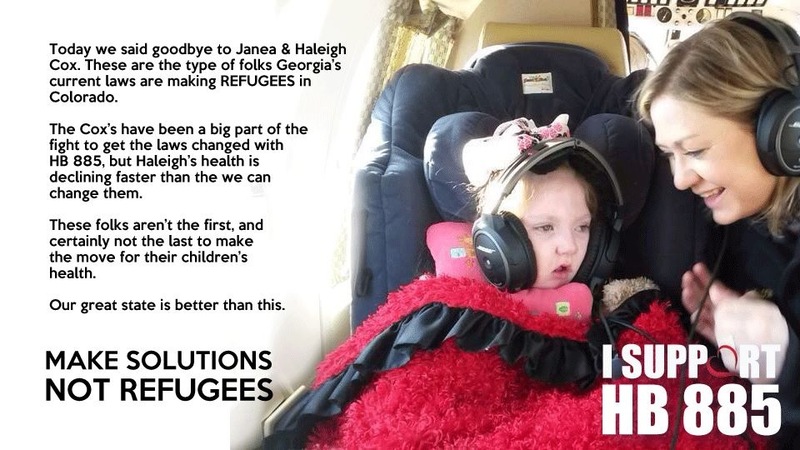 Haleigh is the little girl for whom HB885 is named “Haleigh’s Hope Act.” The awesome Rep. Allen Peake met her and immediately began his crash course into the world of medical cannabis and CBD oil, pushing this Georgia bill with everything in him. But Haleigh’s declining health means she can’t wait. Her father must stay behind in Georgia because of his job. HB885 has passed the senate committee but with major changes. Cultivation is out. Basically, it provides legal protection to a person caught with CBD oil. It does not help us obtain it. This was always a hurdle even with cultivation (there were different issues surrounding that). You’d have to get it in a legal state and get here without being caught. Frankly, places like Realm of Caring are not going to sell it to you knowing you plan to cross state lines against federal law because that puts them in danger of being shut down by the DEA. It’s important to understand that this bill, even if passed on the senate floor, signed by the governor and made law, would not allow everyone to run out and get it for their kids. It does prepare our state, however, for a change at the federal level. If the feds reclassify it with the DEA — as they need to — we are ready to go. And hopefully, passing this in such a conservative state will add more pressure to the federal government to get off their butts and help people. Another twist is that a separate bill is now attached to HB885. The chair of the senate committee, Renee Unterman, has been trying to pass a bill for five years (Ava’s Law) mandating that insurance companies cover treatment for autism (Georgia is one of a minority of states that don’t require autism to be covered). A compromise bill that increases benefits up to age 6 is now part of a package with HB885 called the Kid Care Act. The autism bill has also been tacked onto HB943, which would prevent insurance discrimination over certain types of cancer treatment. The reason is that the autism bill alone would have to go through subcommittee in the House, and thus far, they haven’t been willing to hear it. By tacking it onto bills that have already passed the House, it bypasses the subcommittee when it goes back to the House for approval for the change. Now the bill must go through the Senate Rules Committee and then go to the Senate floor for a vote. Then it goes back to the House for approval. Last day of session is March 20. Nothing like going down to the wire! Once again, if you haven’t e-mailed your Georgia state senator yet to support HB885, you can find out who yours is at openstates.org. Also of note are two op-eds in the AJC today. Eli Hogan shares his experience living with Crohn’s Disease and it is a great read. It is followed by a counter-point from Rep. Sharon Cooper. As you read it, please keep in mind that she voted to pass HB885 twice. First out of committee, then on the floor. I would also urge you to read some of the excellent comments from parents below the essays. If you missed Sanjay Gupta’s follow up to last year’s special Weed, you can find it here. The original is here. Anyone who cannot invest the 45 minutes it takes to watch at least one of these has no right to question the people who are fighting for these changes.